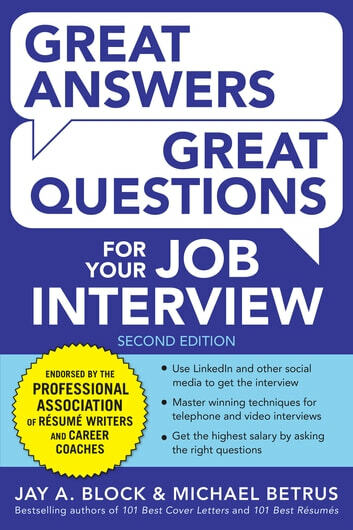 Great Answers, Great Questions For Your Job Interview prepares you to answer the trickiest questions and make yourself stand out from the competition. From pre-interview research to follow-up calls, the authors walk you through every step of the process and provide powerful advice on customizing your resume for any position. Jay A. 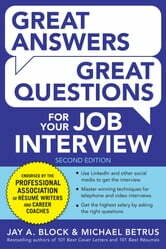 Block is the cofounder of the Professional Association of Resume Writers and Career Coaches (PARW/CC). He developed a groundbreaking career management and empowerment program for the Workforce Development System nationwide, the U.S. Department of Labor, and other leading career and employment-related organizations. Michael Betrus is a sales director by trade, having conducted hundreds of interviews and hires, and a career seminar leader for students on campuses nationwide.